Hope you enjoy these, too! Little Green Notebook makes shades from old miniblinds. Six In The Country shops smart at Habitat's Re-Store. Money Saving Mom considers 100 ways to save $100. Coupon Cravings hosts 5 ways to save big on baby gear. Modgirl pointed me to this $10 kitchen makeover. Love the links - especially the kitchen makeover. Thanks for sharing! How can I submit a link? My blog has lots of tips for getting through college frugally. Wow! The $10 kitchen makeover completely leaves me speechless. That was a lot of painting to take on, but it looked gorgeous. Thanks for sharing! Inspiring links as usual! I love, love, love the window shades (draperies are not so much my style, but I LOVE shades). And, thanks for the link. I am so very amazed with the wonderful things people can do with so little money and just some effort and time. The kitchen make over was just wonderful. The others I am looking forward to reading through as soon as I can. Thank you Meredith. I was inspired by your hospitality efforts to have a group of friends over this afternoon. I have set out my jadite plates, cups, bowls, set the table up for buffet and we are waiting for the fun to begin. Thanks again. Blessings to you. Thanks for the links! How do you have the time to find so many good sources? It will take me a week to have time to read thru all of these, but I will! 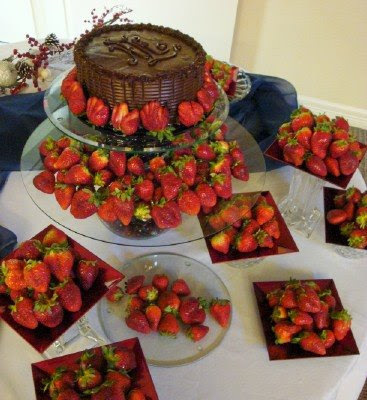 The cake/strawberry presentation looks lovely! The groom's cake, I assume? Love that southern tradition! We had a groom's cake at my oldest son's wedding and none of his wife's family had ever heard of one! And when do we get to see Elise's dress? The glimpse of it in the photo with John makes me want to see all of it! I'm sure she was lovely! Thanks for posting these links, I'm having fun checking them out! YUM! What a great and tempting photo. My mouth is watering now. Thanks for the links too, great stuff! great ideas and links to more great ones! thanks!